The English-owned Los Molinos holiday apartment, for two people, is ideal accommodation for peaceful idyllic holidays in this rural region of Southern Spain. Situated on an attractive pueblo which is terraced into the contours of the mountainside, it is in keeping with the old Spanish style of narrow walkways and staircases. 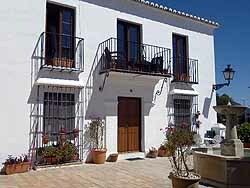 This is an airy one bedroomed apartment, which occupies an excellent site on the pueblo. To the South, the view ultimately leads towards Fuengirola and the sea. On the pueblo side three balconies overlook the private plaza with its splashing fountain. The central balcony has very recently been extended and furnished with two comfortable armchairs and a coffee table. 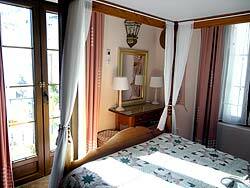 Indoors, the decor is Spanish style with tasteful furnishings and some genuine antiques. The recently refurbished kitchen, is well equipped and includes full oven and four ringed ceramic hob, fridge, microwave, washing machine, tumble dryer and ironing facilities, plentiful supply of cutlery, crockery and cooking utensils. The bedroom has ample fitted wardrobe space, four poster bed, bedside tables with angle lamps above, full length mirror, dressing table with large mirror, lamp, stool and hairdryer. There is a versatile air-conditioner/heater system to suit summer and winter visitors alike. 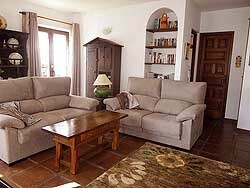 The large lounge/dining room is light and airy, comfortably and tastefully furnished in antique Spanish style. Three double french windows open onto balconies, the largest one of which has comfy outdoor seating and there is a fireplace with an attractive, easy-to-use, electric stove. The stove is fan operated for heating or cooling or, if preferred, can simply provide a soft, rosy flame effect for mood lighting. The bathroom is fully tiled and has both bath and shower facilities, toilet, washbasin and bidet. There is a safe inside the wardobe. Entering the pueblo from the main road is like discovering a different world. It is a select residential area adorned with fountains and flowers complementing the sandy coloured flagstones and terracotta tiled roofs. A swimming pool, shared only by owners and renters, is to be found two terrace levels above the apartment. There are excellent local amenities. Served by three nearby restaurants, the pueblo also benefits by being only five minutes walk from a well stocked supermarket, and ten minutes from Mijas' buzzing village centre.